Remember when I promised some Mahna Mahna? After much sewing, hot-glueing, and dancing around and singing, the kids' Halloween costumes are finally finished. I am SO happy with the way these turned out (and so are they)! Paul already has the video loaded onto his iPod (which has speakers) and will provide a soundtrack - or an explanation as needed - when we go trick or treating. 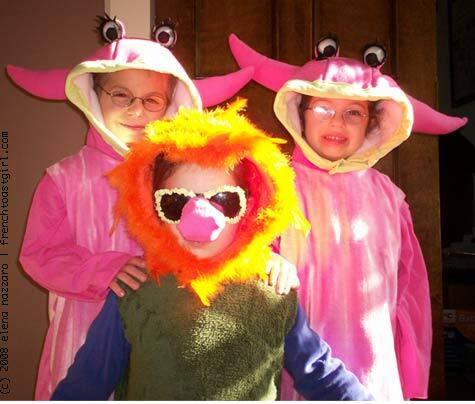 And instead of "Trick or treat" they can say "Mahna mahna." I had the best time making these! 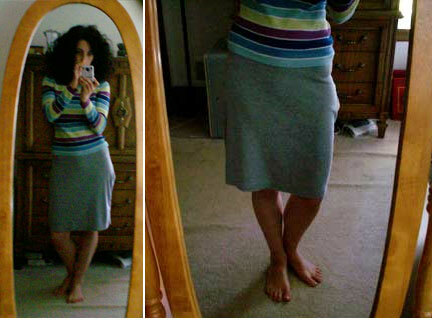 I didn't have any kind of pattern, I just made it up as I went along. And now it makes me want to go back to making puppets even more. For those who need a refresher course on Mahna Mahna and the Snowths, watch this. And crank it up! Remember when I posted recipes for parfaits and sun tea this summer? Someone said, "You really oughta have those published." Well, thanks to the super-fantastic people at Craft: Magazine, this one is! Yay! Click here to see the full illustration, where you can zoom in and see it in greater detail than I could ever fit on this blog. 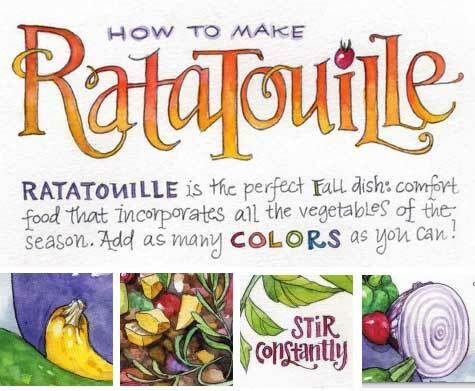 Go, enjoy, and most of all, please go make your family some ratatouille because I promise it's absolutely delicious. And this year, I'm going to give a prize! 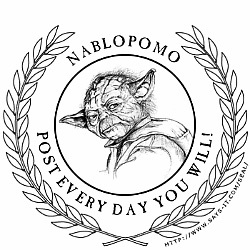 Just sign up at NaBloPoMo headquarters and post every day to qualify. Found this lovely film via CuteOverload. My mamacita's birthday is today, and we will be calling her soon to sing at the top of our lungs as we do for all birthdays. Watch this, then call your mom and tell her how much you love her. 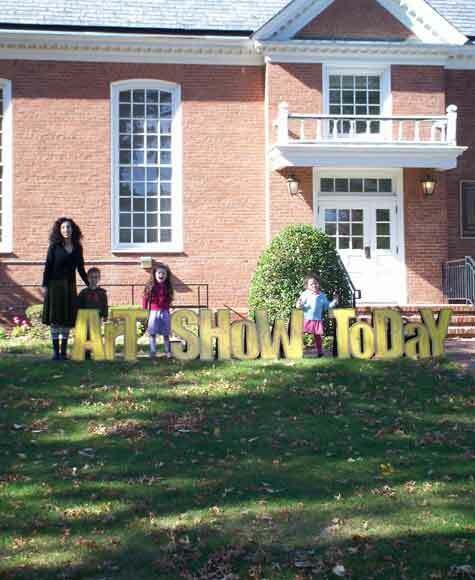 It's been an exciting week - I have two paintings up at the Westfield Art Association's Autumnal Exhibition going on right now at the Community Room on East Broad Street (in the same building as the police station, next to Mindowaskin Park). I know not all of you are in town, but in case you're passing though Westfield, you might want to check it out. It's running from October 19, 21, 22, 25, and 26, from 1pm - 4pm. 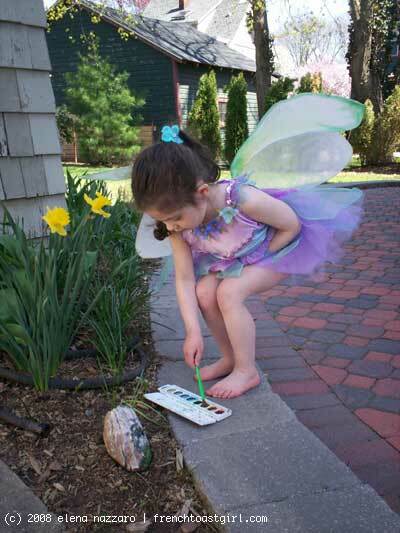 It's free and open to the public, and you could see the Blossom Fairy and Storytime in person! The kids had their own art show up at our house as well - our walls are covered with even more than the usual amount of drawings! As soon as I can set up a little photo album, I'll publish both our sets of gallery experiences - together. Things have been ca-razy busy here, and I apologize for not posting more. I've been working on new illustrations I can't show yet, knitting and crocheting just because it's fun, working on the kids' Halloween costumes, and oh yes, there's that day job. I'm also getting into gear for NaBloPoMo in November, are you? ♥ Do you walk enough? ♥ Proposition 2 (or, 67 Square Inches). Proposition 2 "stops cruel and inhumane treatment of animals, ending the practice of cramming farm animals into cages so small the animals can't even turn around, lie down or extend their limbs." A new painting, another learning experience! Trying to be faithful to the photo, I did a pretty tight sketch and started to do some watercolour washes. 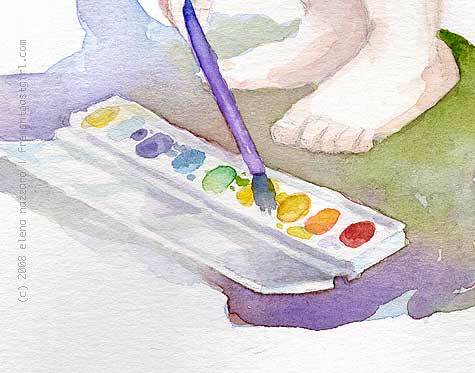 But the spirit of it just eluded me... every time I would put down a color, I'd blot it back up. I was being really timid about paint, which just ain't me. It was starting to be pretty, but that wasn't what I was going for. So I put it aside, and thought about it, and realized what I was doing wrong. 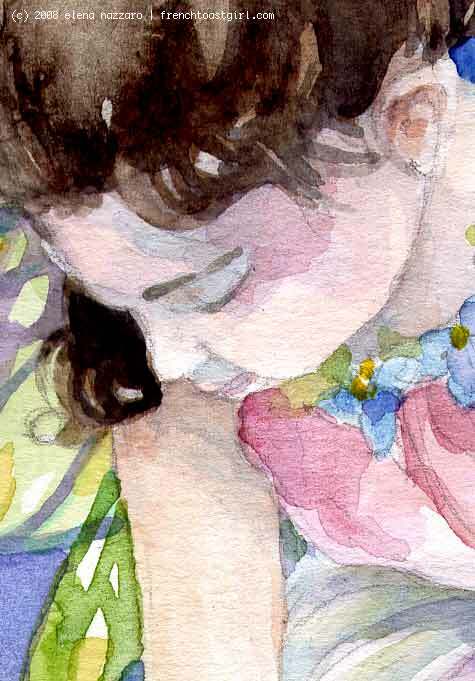 Like this painting, I was trying to do watercolor "right" and try new techniques out I wasn't comfortable with, but it instead was losing the whole spirit. Remember when I did the painting of Angela in the grass and I said, "I did the background first, next time I'll do the subject first"? Well, that's what was missing. 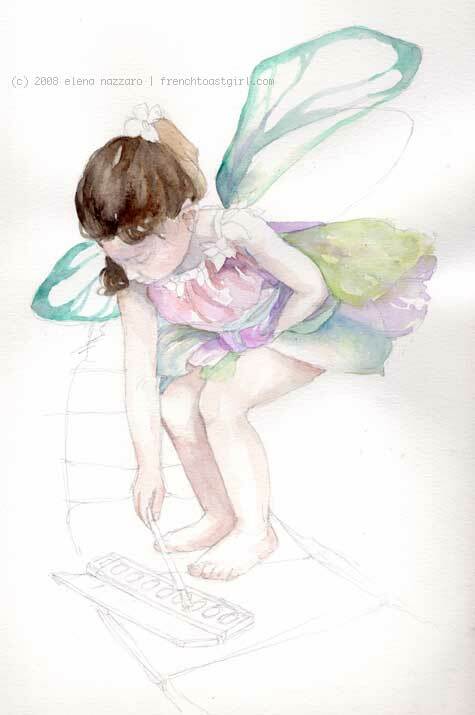 The point of the whole painting is Sophie, the fairy girl. 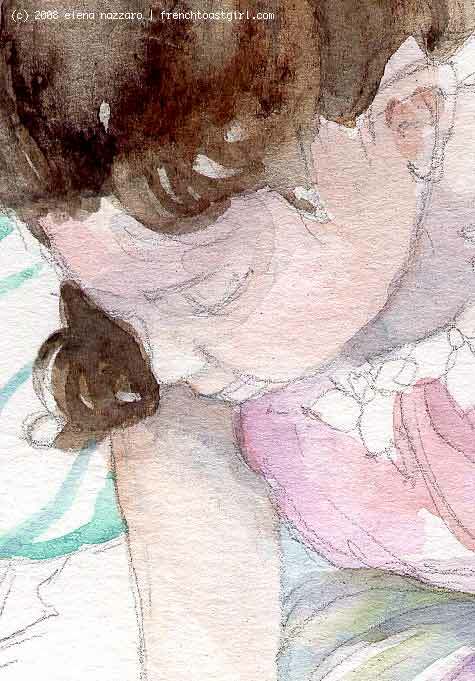 And more about that - I'd decided early on that I didn't want this to look like a little girl in a costume in her backyard, but that's what it was turning into. So I stopped thinking of her as Sophie. And that helped immensely. I didn't worry if her coloring looked right, or her hair, or if she looked age-appropriate blah blah blah. 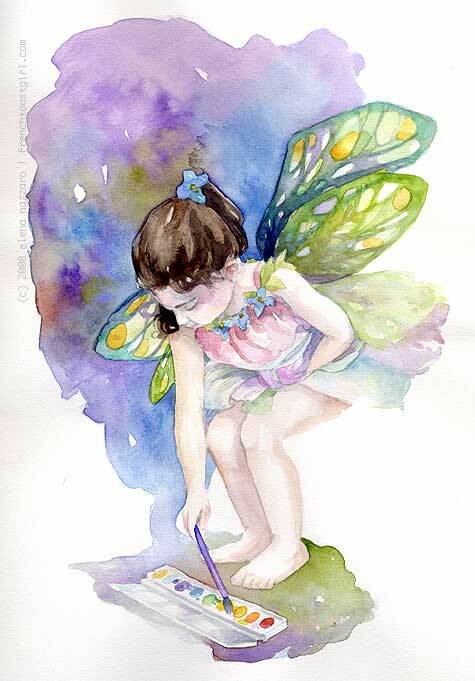 I was painting a fairy, and that meant I could get as wild as I wanted! Before... I'm trying too hard to make her look natural and as lovely as she is. After... while it may not look precisely like Sophie, it captures her spirit so much more vividly (and accurately). I wound up erasing all the pencil I could, leaving just what I needed for the barest guidelines, and went to town, splashing color all over the place. 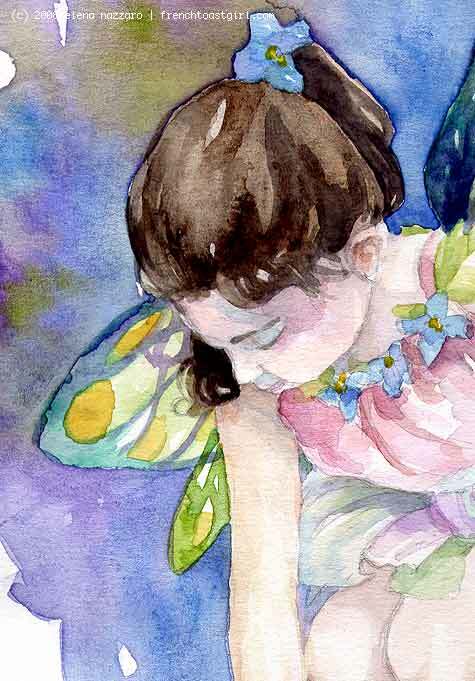 You all have no idea how much I had to fight myself NOT to go in and do perfectly rendered veins on the wings, to do her eyelashes and hair perfectly, and to make the lines in the watercolour set perfectly straight. LESS IS MORE, remember? I'm so proud that I refrained from overworking it all. Take this down: It doesn't have to be perfect. I am just so happy with those edges where one color bumps up against the other - back in the day, I would get that kind of contrast with a very sharp pencil or fine pen. Now it's nothing but pure color. (Ooh, I'm getting shivers about it again.) And the hair, I'm quite pleased with that. And especially the edges of those wings becoming organic and leaf-edged - I couldn't have made that happen if I tried. I'm trying something new - my first ever poll! While it's partly because I just like to try new things, it's also prompted in a part by a spate of image-grabbing that I'd like to put a stop to. I'm thinking of blocking all of my images from Google's image search, but not if that's how most of you found me! So, cast your memory back there, lord, and see if you can remember how you got here. Please select one of the buttons below. Thanks!